I was taking the car out for what was meant to be a good 300-mile round-trip which I'd done several times before, but as I made my way down the road I knew something wasn't quite right. The car was stuttering quite a bit and when I reached the first junction it died completely and refused to start again. This was the same behaviour it showed when the condenser had failed, so I pretty much knew what the problem was. Luckily I did manage to get it started enough to make it back to the house under it's own power - just as I'd pulled out the tow-rope, so I like to think it didn't want the indignity! Anyhow I couldn't do the trip that day in the B, but I ordered a couple of condensers from the club which would arrive for when I got back. 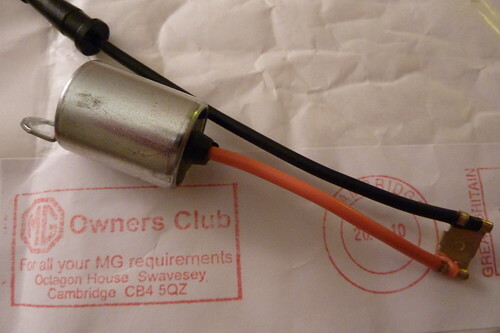 I'm working on the assumption that the condensers these days just aren't up to much, which seems to be the widely held belief and why a lot of B drivers have made the jump to electronic ignition. Sure enough, fitting the new condenser cured the problem and the B's back on the road again - now with a spare condenser in the boot!